Vinyl floor tiles are manufactured from a number of layers that create a highly durable flooring surface with many benefits compared to traditional materials. To create each layer, PVC, plasticisers and stabilisers are blended in an industrial mixer. This molten material is exposed to heat and pressure and passed through a series of rollers to produce flat sheets of material, a process known as “calendering”. The sheets are laminated together to produce one sheet. During this process, the surface texture is applied to the top layer, using metal plates to emboss the pattern on to the sheet. The sheet then undergoes “annealing”, which removes internal stresses by controlled heating and cooling, to ensure the product is dimensionally stable. The product is then cut into tiles, strips or designs and packaged for sale. Base layer: designed to adhere to the subfloor. Middle layer: the tile’s core, providing strength and stability. Wear layer: a hard-wearing but transparent layer embossed with a texture for grip and to enhance the visual effect. The thickness of this determines the durability of the floor. Generally, a rougher wear layer will increase the slip resistance. Polyurethane coating: a thin coating that seals the product and adds durability. There is no need to seal the product after installation, saving time and money. Recycled PVC: closed-loop recycling means that any manufacturing waste goes back into the system. Fillers: reinforcement in the backing and middle layers to provide mechanical strength. Stabilisers: to prevent the material from degrading. Plasticisers: to make the material more flexible and durable. Photographic film: on to which the design is printed to give a realistic appearance. Polyurethane coating: applied to keep the product in good condition and help prevent scratching. Vinyl flooring products will not harbour dirt or dust mites, helping to ensure cleanliness and maintain a healthy and safe environment. There is no need for chemical or steam cleaning, as with carpets, and no grout lines, as with stone, which can harbour germs. Because vinyl flooring is relatively thin (typically 2-4mm), there is no need for major remedial work such as resizing doors and moving pipework for new flooring. 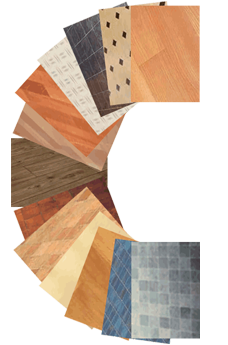 Vinyl flooring is easier to cut and install in commercial environments. It is much lighter to handle than natural products such as stone, minimising health and safety risks on site. Vinyl tiles are also easier to repair and replace in comparison to sheet vinyl products, stone or wood. Vinyl flooring is quieter underfoot than stone, wood or laminate. 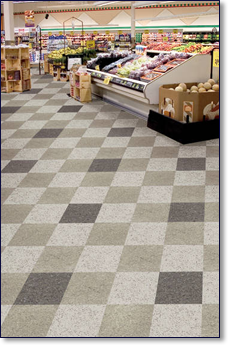 Vinyl floor tiles offer a faithful representation of natural products. Due to the product’s consistent thickness and ease with which it is cut, innovative designs can be created .